I understand that much of what the Russian engines are capable of is due to superior metallurgy. The engines are probably stronger at higher temperatures than comparable US engines. They really are going to surprise people if they swap RD-180 out on Rus in favour of RD-0163. Yeah, knowing practically nothing on metallurgy, it’s a tough subject to me… and I assume closely guarded secrets exist as well? 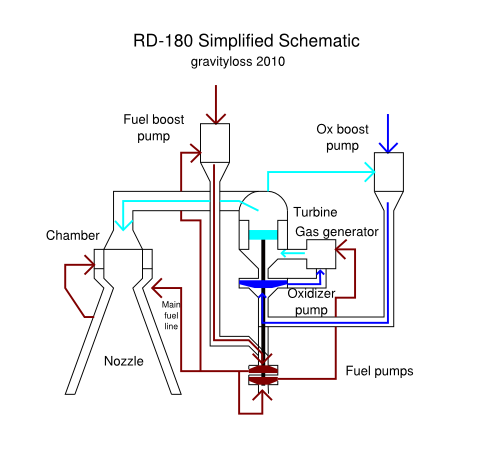 RD-0163 I found some article saying an RD-180 replacement with a separate fuel for the fuel turbopump to avoid charring / coking? But it’s an oxidizer rich cycle anyway… do the seals leak so much kerosene that then burns? It’s a nice diagram but it’s not clear to me where the preburner is located? he simplified – the preburner counts a s a starter or igniter – part of the system or so some people say.